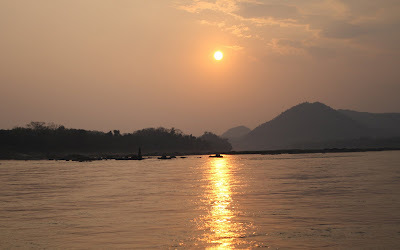 Sunset on the Mekong River. This is the photo that made the whole two-day trip from Huay Xai to Luang Prabang – the hundreds of farang, the ever-present drone of the boat's engine, the unyielding hardness of its wooden floor – absolutely, incredibly and amazingly worth it. The two-day slow boat ride to Luang Prabang, Laos, began with a short ferry ride from Chang Khong, Thailand, a quiet strip of guesthouses and restaurants nestled against the banks of the Mekong River about a six-hour bus ride north of Chiang Mai. The bus ride north was tolerable, the twisting monotonous span of road cut across terraced fields and through wide canyons while Thai music videos – fraught with heartache – played on an old television strapped into a small shelf at the front of the bus. 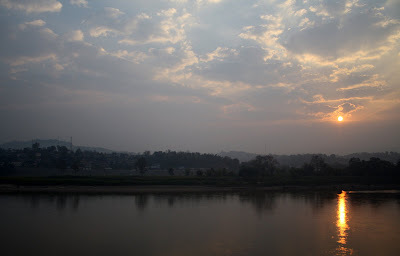 After pulling into Chang Khong just as dark was settling on the one-lane town, I checked into an immaculate guesthouse drowning in teak furniture and Thai artifacts, overlooking the placid expanse of the river. Across the main road, the guesthouse's restaurant offered bowls of red and green curries – chunks of turnip, tomato and onion swimming in a spicy broth – that was welcome nourishment after a day spent eating hot-chili-squid-flavored chips and drinking green Thai soda. In the morning, the guesthouse owner's brother expedited our visa process – a few stamps and some signatures at a restaurant down the road – and dropped us at the ferry pier. A dozen farang piled into a sliver of a boat, which sliced its way across the glassy water, landing on the Laos side of the border. 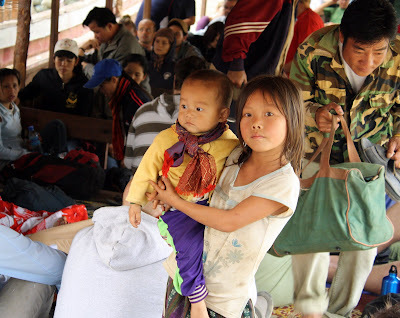 The immigration process in Huay Xai – the Laos town opposite the river from Chang Khong – lacked any semblance of order. Scrambled herds of farang clambered about on a concrete platform, filling out visa forms and moving from one undermanned window to another. Our expedited visas didn't clear any hurdles for us; all the farang seemed bound by the same innocuous-but-time-consuming red tape. But according to one, a tanned and wrinkled man from England, this Laos immigration checkpoint was an exemplar of bureaucracy: he had recently come from Tibet where, he told me, the immigration official at the border had to be woken from a nap, whereupon the farang was led to a line of hundreds of other border crossers and spent most of the day waiting in queue. 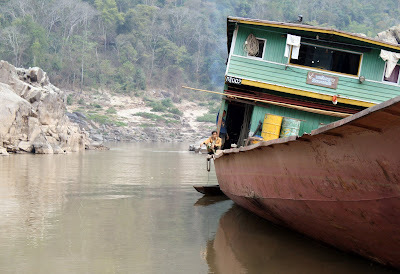 The plain hulk of the slow boat – a 12-foot-wide, 45-foot long, shallow, covered craft – left the Huay Xai pier at 12 p.m. An incredibly loud, massive engine puttered the oversized raft downstream along compacted sand beaches and thick-with-green banks, while pillars of smoke from rubbish fires dissipated in the thickening haze. The mountainous terrain of Laos rose up steadily, like unfolding layers of a fan, while water buffalo lazed in the sun, barely lifting the heads as the slow boat droned along the muddy, sweet-smelling drift. The young crew – a cluster of smiling boat boys – traded off tending a small cooking fire on the back deck – blackened pots scattered about, cooking utensils hanging from crudely fashioned hooks. A canister of a dozen brightly colored toothbrushes hung to the left of the back doorway across from a line of drying laundry. Farangs lounged with books or playing cards or – for those who showed up to the pier with last night's beer in hand – slept on a thin straw mat at the center of the boat. Two hill tribe women across from my bench also napped – one against the crook of her hand, the other against the blue-railed sideboard of the boat. 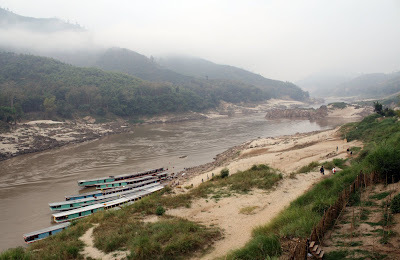 Jutting worn rock crept from around the jungled maws of the river's bends, while a jovial young Laos man in a military-green jacket and a red bombardier's scarf steered the boat. The skeletal remains of drooping bamboo poles – fishing nets strung like cobwebs – lodged in the multicolored limestone rising up from the brown water. Small children on the banks stood in the shallow lees, framed by white crumbling beachhead now exposed in the dry season – the river halved by the heat – and compacted by layers of animal blood, plant ash and the plodding insistence of history. 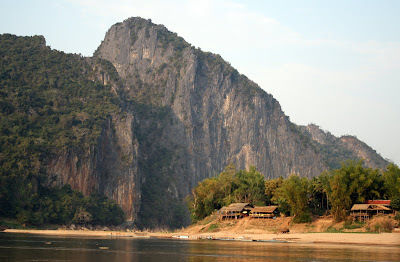 An imposing limestone cliff – or karst – shoots up from the banks of a small tributary along the Mekong River. 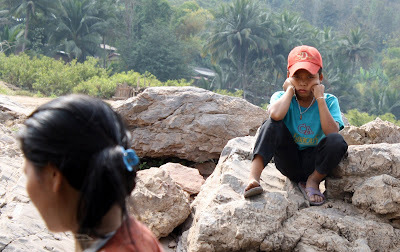 At a midpoint stop on the second day, a boy broods from his rocky perch on the banks above the slow boat. 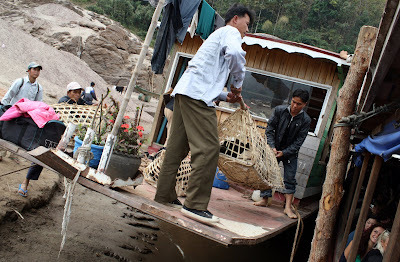 Rock perchers on the second day of the slow boat ride to Luang Prabang. 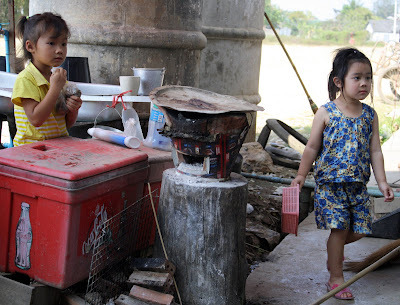 The presence of stoic locals along the Mekong's banks added to the mystical vibe of this ancient river. 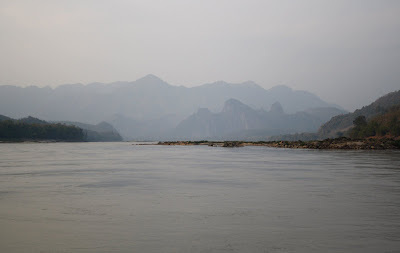 A hazy mist obscures Laotian hillsides and the next bend in the lazy and quiet Mekong River. 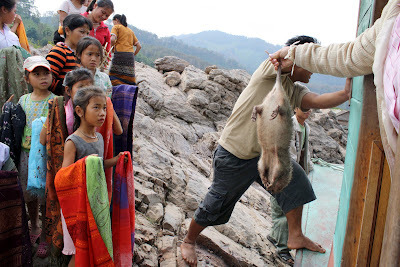 At a stop along the Mekong River, a woman holds out some kind of muskrat – freshly killed – for one of the boat workers to bring aboard, which grosses out the farangs, doesn't phase the old locals, and delights the boat boys, who seem to get a kick out of startling travelers with local customs. 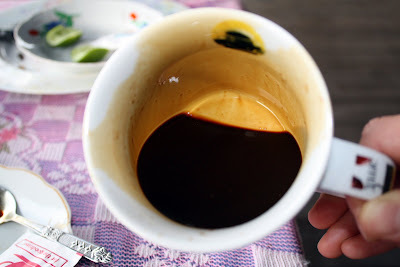 Laos coffee from the guesthouse in Pak Beng. This stuff was so strong it leeched into the sides of my mug and, even after a healthy dose of condensed milk and two artificial creamers, was the color of crude oil. Early morning in Pak Beng looking downriver. 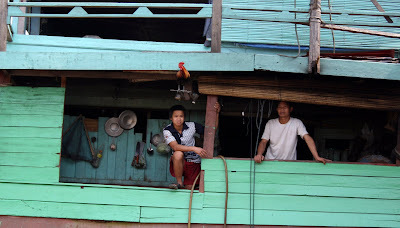 This small village is little more than a cluster of guesthouses high up on the banks of the Mekong River. The generators here thrummed loudly until midnight, when they were abruptly shut off and I was left to listen to round robin of roosters cockling in the pitch black. 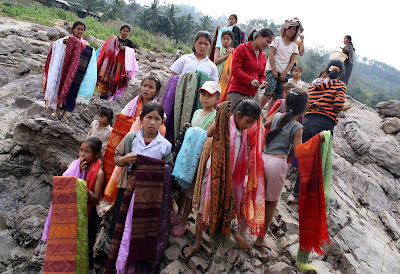 Girls attempt make their out to the edge of a rocky outcropping to sell fabric to slow boat riders at a small stop along the Mekong River. Another slow boat passes ours near at a dock near a small village somewhere between Pak Beng and Luang Prabang. 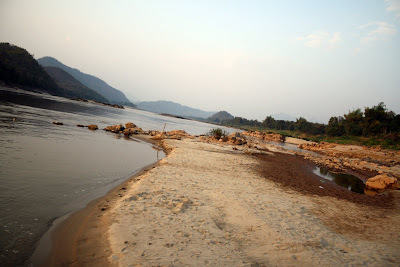 The sandy, muddy banks of the Mekong River. More sleepers in the back of the slow boat. Even five feet from the grinding roll of the boat's engine, these farangs and locals were still able to catch a few winks. 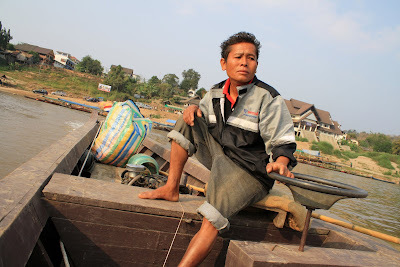 A boy perches on the prow of a neighboring slow boat at one of the many stops along the Mekong River. 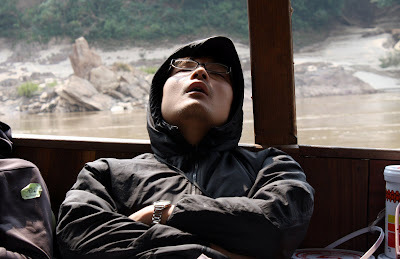 People didn't need much to fall asleep on the slow boat. This young man spent most of both days on the river propped up in this position, apparently able to drown out the knocking drone of the boat's gigantic engine. A reader finds respite on the back deck of the slow boat. 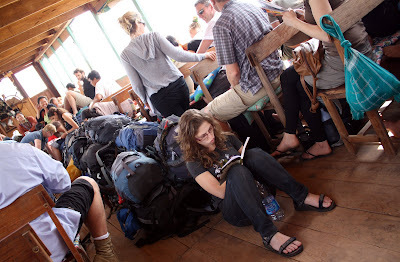 People made do wherever they could on the slow boat – leaning against backpacks or lying prone in the middle of the boat – anything to finish the next chapter in that coveted novel. A man smokes a cigarette on a spot on the floor at the front of the slow boat. 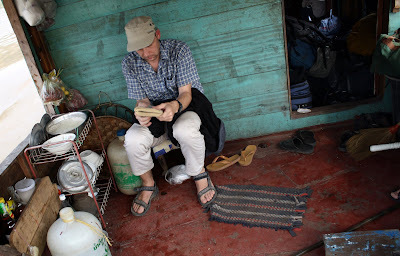 When he got on the boat at a midpoint, he began by sitting on one corner of a farang's inflatable mat, but by the end of the trip on the second day he occupied nearly half of the the farang's cushy seat and didn't seem to notice – or care – if he was intruding. 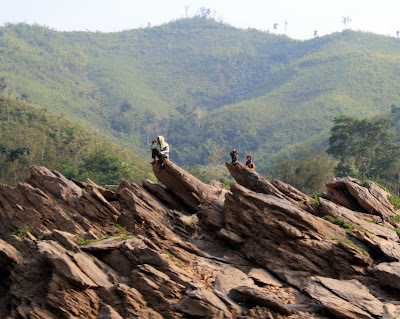 Limestone rocks, normally covered in the rainy season, rise up out of the muddy calm of the Mekong River. Any feature of the landscape more than a couple hundred yards away is obscured by the ever-present haze. 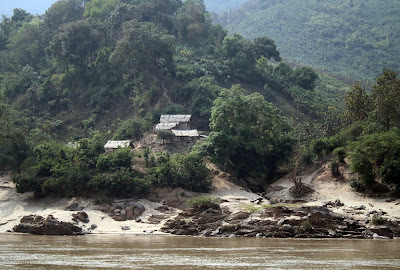 A simple bamboo and thatched-roof dwelling clutches to a hillside above the banks of the Mekong River. 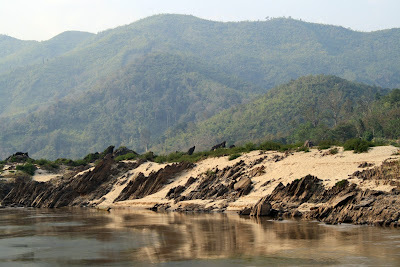 The sandy, vegetated and limestone-scarred banks of the Mekong River. 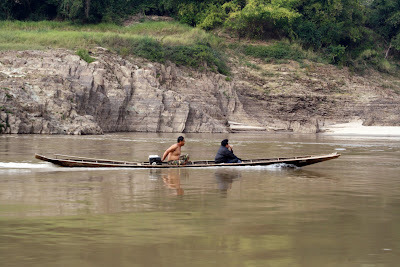 Men on a longboat speed their way up the Mekong River. These boats were little more than a solid carved out hull with a small engine attached back or in the middle, and seemed to glide precariously close to the water's surface. A small girl holds a small child after boarding the slow boat at a village on the way to Pak Beng. 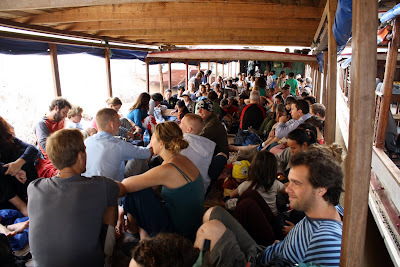 Seating was sparse on the slow boat and many people stood or straddled the thin outside railing, which afforded great views of the passing Mekong River's banks. A cargo of chicken in woven reed cages is loaded unceremoniously onto the top of the slow boat from the dock at a stop on the Mekong River. Animal rights activists might get squeamish at the sight of non-coddling animal treatment in Asia, but rest assured: when the chicken arrives on your plate, it's still delicious. 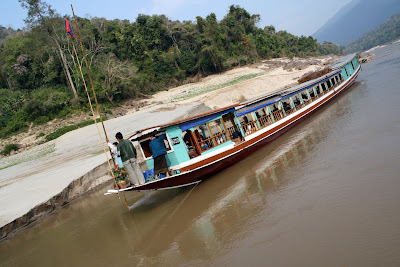 A moored slow boat at one of the many stops – executed with gentle precision by the boat boys – on the way from Huay Xai to Luang Prabang, Laos. Cramped conditions on the six-hour ride from Huay Xai to Pak Beng, the midway point of the two hour journey. 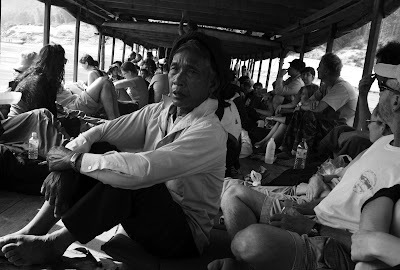 Farangs from all over crowded onto the boat where seating was hard to come by, but people, in general, were civil. 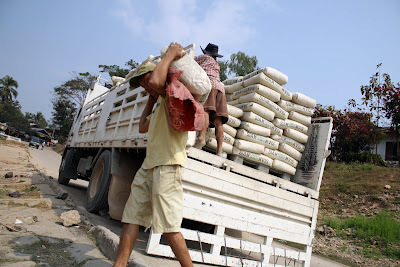 Workers unload bags of concrete mix from a truck onto one of the many slow boats docked at Huay Xai carrying passengers and other cargo – rice, chickens, empty bottles – from one section of the Mekong to another. Two boys watch from the back of their slow boat as our own slow boat passes out of the Huay Xai pier and turns to make its way downstream. A boatman shuttles a small ferry to the Laos side of the Mekong, the early morning sun in his face, the breeze through his hair, the first of many short trips across the river he would make that day. Mid-sized slow boats docked on the Laos side of the Mekong. 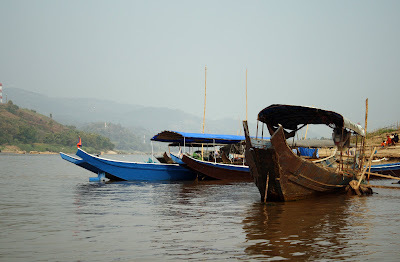 There were many boats on the Mekong, but they all generally followed the same design: shallow, skinny and long. Early morning on the Thai side of the Mekong River, looking across to Laos. The Mekong was not as big as I was expecting – it's about half full right now – but its slow drift and ancient serenity were impressive nonetheless. 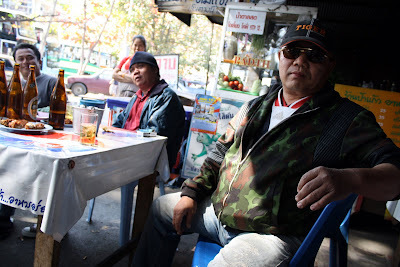 Tiu, a Chiang Mai tuk-tuk driver takes a break with some co-workers at the Chiang Mai bus station after pulling an all-night shift shuttling locals and farang around Chiang Mai. Tiu's English was pretty good and he enjoyed talking with us, though the conversation started to get repetitive after we'd been through the basics. Two girls playing at a bus stop in between Chiang Mai and Chang Khong. The bus ride was six monotonous hours of flat fields, timid hills and the heart-wrenching ballads of Thai music videos. 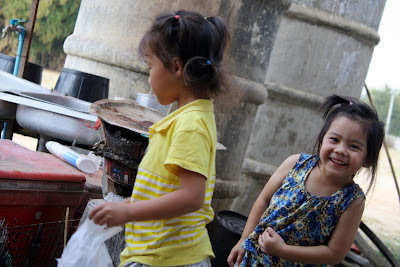 Two girls playing at a bus stop in between Chiang Mai and Chang Khong. These two were so adorable I couldn't helping getting a little snap-happy.